Greetings from the Stockholm Light & Furniture fair! We just attended a talk with Judith van Vliet, president of Color Marketing Group, a non-profit whose members are made of "color design professionals" (designers, artists, etc). The way Color Marketing Group predicts trends seems unique: Their members gather together for conferences where regional palettes are decided on. But it doesn't seem to be fashion or trends that drive their decisions. Rather, CMG members look at the current emotional climate of a region, and from there certain colors correspond. For example, the colors determined to be prevalent in Asia Pacific for 2020 came out of "rediscovering empathy," "going off-road," and "centered," which somehow translates to lots of greens. A muted deep green that supposedly speaks to the unpredictability of nature (hurricanes, earthquakes). "The green of Ver-de-verdad becomes a symbol for the beauty, and the potentially destructive character of nature, as well as a beacon of hope and understanding." An anti-technology hue that embraces exploration and simplicity. The colors for North America for 2020 are driven by action, connections, choice, basic human values, and a path forward. 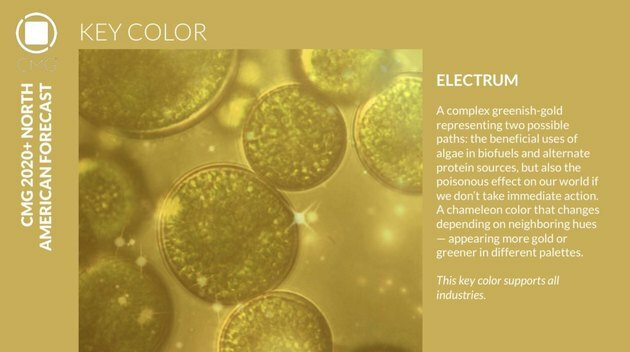 "The green and gold essences of Electrum represent different paths as 2020+ approaches, and symbolize the complexity of the future." According to Van Vliet, Europe's colors are focused on tradition, decluttering, and looking back (although there is one section that is more technologically driven, about gaming and how people are integrating with technology).This earthy, clay-like pink alludes to reactivating sense and touch.